Making the cut. It’s a phrase that’s used in a number of different types of cases where candidates of some sort go through a screening process where in some are retained and others discarded. If you think about it, the friends in your life right now are likely a selection of people who have made it through various cuts over the years. Today's Note: Football, Offense, Defense, Championships and Damn Lies. Quick Note: High Definition Earth Photograph. How the Brantford Library understands "The Social Media Business Equation" by Eve Mayer Orsburn. This is an example of how valuable social interaction and social connection can be in a system like empire avenue. Certainly this is no scientific analysis or study of comparisons between different philosophies. It is just one example what kind of effect the “social component” can have on the market itself. Steve was so gracious to start a mission for me with 200*2000 eaves to be invested into my shares with the aim to push me above 100e share price. 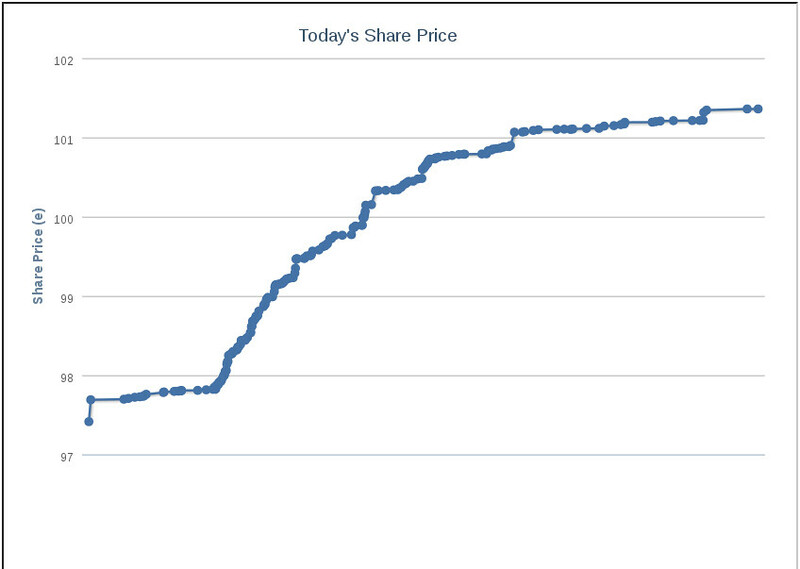 At the beginning of the day, the share price was about 97.7. During the last week, the share price had grown about 5e, in the last days the increase had accelerated a little, so a good estimation would have been a 100e share price at the end of the week. The day started very normal, as can be seen at the left side of the following illustration. However, then the frequency of transactions increased dramatically, which started shortly after the mission by Steve (about a 70 of the 200 slots used). 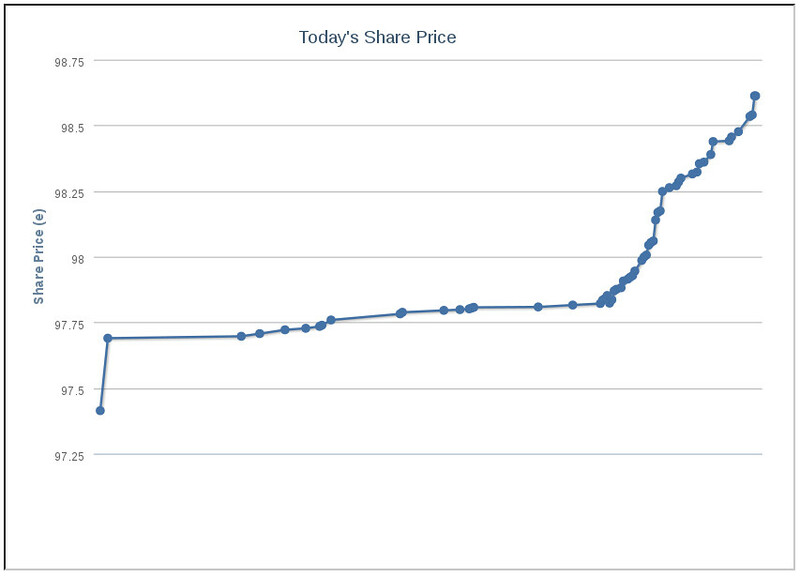 After about 100 of the mission slots used the share price graph looked like this. Finally the graph from the end of the mission with about 90% of the slots used. As can be seen, this mission that was worth 4m eaves, almost my net worth at the beginning of the day, push the share price up 4e, a only jump that would usually take almost a week of steady increase. It was possible through the help through the social component of Empire Avenue, partly through Steve’s mission and partly because a lot of other contacts bought far more shares than the 2,000e worth Steve offered to them in his mission. This is just a first analysis of the day and the mission. Probably I will follow up with some more data and analysis of other aspects in the following days. 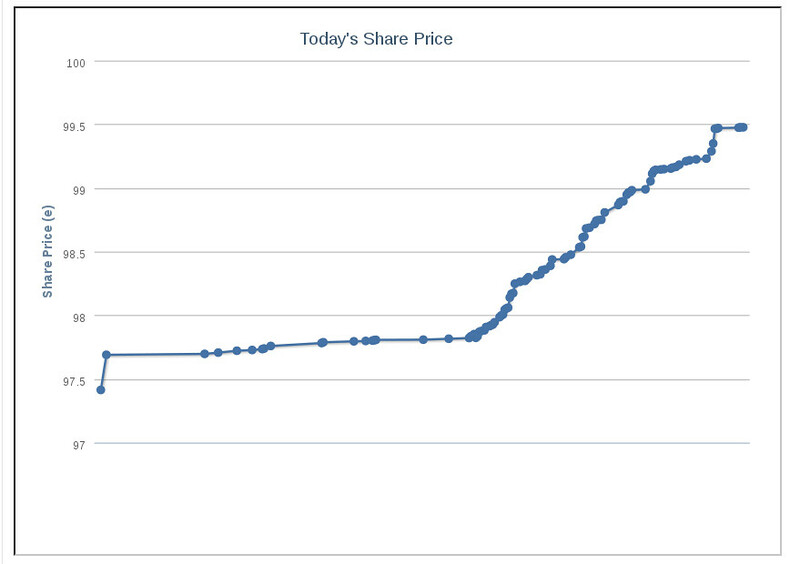 Thanks again to Steve for making this possible and everybody else who has participated and invested in my shares. It was a thread in Team Zen, but it felt as though it really could have used a bit of self help from the 1970’s. Empire Avenue is a very intriguing and complex web site. It is in one sense an equivalent or perhaps competitor to sites like Klout and Peer Index. But at the same time it is most definitely a social networking stock market trading game. And I honestly don’t think it is in the least bit fair to criticize one’s friends because they are “playing to win” in what is most definitely a game, that has been specifically offered as such by the gentlemen (Are there any ladies on the EAv Team?) who put the site up on the web every day. There are lots of strange laws in the world! The strangest laws in the world are sometimes so strange that even the people living under them cannot fathom the how or why of their existence. In some cases, laws we view as strange are simply outdated blue laws from a bygone era, but in others they are actually fairly new and still just as illogical. One of the important things to remember when identifying what is strange is that a law may be strange to people in one culture but not another. With that in mind, let’s take a look at some truly odd laws found around the world. The top fifteen should suffice. Wonderful article bny Shirley Williams. Well worth the time to read! Last month I shared 40+ networks that you could consider depending on your niche or interests. As part of my commitment to this community, I shared that I will expand on this list throughout 2012. So here is the first addition to that build! 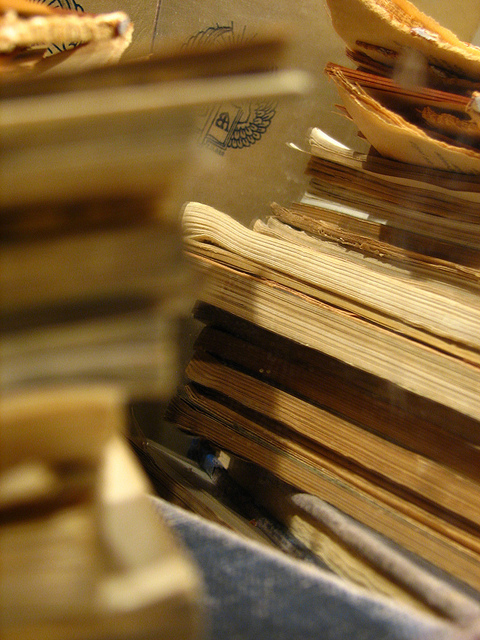 The topic- Curation! I thought I would focus on curation because a) I have a favorite site and b) there has been a lot of “press” on Pinterest as a curation tool and as a result I thought the timing was right. However before I list the sites let’s talk curation.